Motor racing, also known as car racing, automobile racing or auto racing, is considered one of the most expensive sport and hobby in the world. And aside from expensive cars and race track it requires, car racing is tremendously a physical activity. Just as how much it cost for you to get off on a track and play, racing can be a little too much as you want it too and spend far more than you initially planned to. But this doesn’t stop a fan from loving this sport. Sure, this sport requires a lot more than just physically and financially, but that amount is way too far behind compared to the satisfaction, fun, and excitement racing can fully offer to someone hooked on to this kind of sport. Car racing is an amateur and professional automobile racing practiced in a variety of forms across many countries – either on race tracks, roads, or closed circuits. It includes karting, speedway racing, sports car racing, drag racing, Grand Prix racing, stock-car racing and midget-car racing, as well as hill climbs and trials. Local, national and international governing bodies divide the car racing into various classes and sub-classes and supervise the competitions. Yet, there are many other forms of racing which are continuously expanding through the year, each with different rules and regulations, such as car regulations and pit stops, for all cars and drivers to comply. >>> Here is the latest car background checking service, CarVeto car check. They offer a free check using any UK vehicle registration number. Early History: When Car Racing First Started? Automobile racing traces its roots to the creation of the first petrol-fueled autos in the late 19th century and soon after, the internal combustion auto racing began. The first organized automobile competition was initiated by “Le Petit Journal”, a Paris Magazine, in 1894 with a distance of about 80 km and was won with an average speed of 16.4 kph. This sporting event was a “tried and tested” form of publicity stunt and circulation booster. The first real race was held year after with a distance of 1,178 kilometers, driving from Paris to Bordeaux, France and back. It took the winner an average speed of 24.15 kph. Both early races were sponsored by newspapers for promotional purposes. The sport quickly spread to the United States, where the first race traversed with an 87-km race from Chicago to Illinois and back in 1895 during Thanksgiving Day, which the winner took more than 10 hours to complete the race. The event’s press coverage first roused significant, serious interest with cars since then. Town-to-town races in France, or from France to other countries, became a norm in Europe until 1903 when the authorities stopped the Paris-Madrid race due to a large number of accidents. In 1898, Course de Périgueux, considered to be the very first closed-circuit road race, was run with a total distance of 150 km. Closed-circuit racing was governed and founded by Automobile Club de France in 1895 and prevailed in Europe except for Scotland, England and Wales. 1900 racers by then achieved speeds of more than 80.46 kph. Alarming risks and dangers to livestock on the road not created for automobile, racers, and speculators, let alone racing, basically caused road-type races to decrease in number. A total of nine fatalities caused the French government to ban the open-road racing and stop the race in Bordeaux; although Mille Miglia became an exception and allowed to continue until 1957.
International racing in the modern sense began after the owner of “The New York Herald”, James Gordon Bennett, offered a trophy to be competed by national automobile club annually; each presenting three racing cars that had been created and built with parts made in their respective countries. The automobile club in France called the Automobile Club de France, set several international races that gained a lot of watchers from all over the world. These races usually happen from or to Paris, connecting with another major city, in France or elsewhere in Europe. The first Bennett Trophy races have been organized and facilitated by Automobile Club de France in 1901, 1902 and 1903. The event was later held in different places each year: Circuit of Ireland during 1903, Taunus Rundstrecke in Germany during 1904 and Circuit d’Auvergne during 1905.­­­ The unwillingness of French producers to be restricted to three-car rule led them to boycott the Bennett Trophy Race in 1906. The foundation for the first Grand Prix Race that year at Le Mans, France declared that cars are to made by manufacturer’s team since then. The primary Targa Florio, with distances varying from 72 to 1,049 km, kept running in Sicily that year and from that year on except during the wartime. The racing circuit was closed in 1939 as wartime aircraft production took over. From 1904 through 1909 (except 1907), a trophy raced for on Long Island has been established at distances ranging from 450 to 482 km. Soon after, the race was run at Santa Monica, California; Savanna, Georgia; Milwaukee; and San Francisco. It was discontinued later in 1916. In the year 1936 and 1937, Vanderbilt Cup races were run at New York, Long Island, and Roosevelt Raceway. During the early racing years in the United States and Europe, competing racing cars were usually set as the next year’s car models. Racing became excessively specialized for the use of production cars, although, high-performance, superior touring cars were stripped of their bodies and fitted with uncommon seats, tires, and fuel tanks for racing. Still, later in 1939, stock-car racing began with standard models changed for racing. As the sport evolved through the years, some cars were made more aerodynamic and lighter, packed with superchargers. Now stock cars, rally cars, production cars and more all race under their own unique rules and specifications. Automobile racing in North America and Europe was essentially different until the Grand Prix racing was organized worldly in 1950’s, after the first Grand Prix race in 1906 in France and Indianapolis 500 race (byname Indy 500) in 1911. Racing in the United States was primarily on speedway tracks while the track for Indianapolis 500 varies from half-mile dirt tracks to 2 ½-mile tracks. 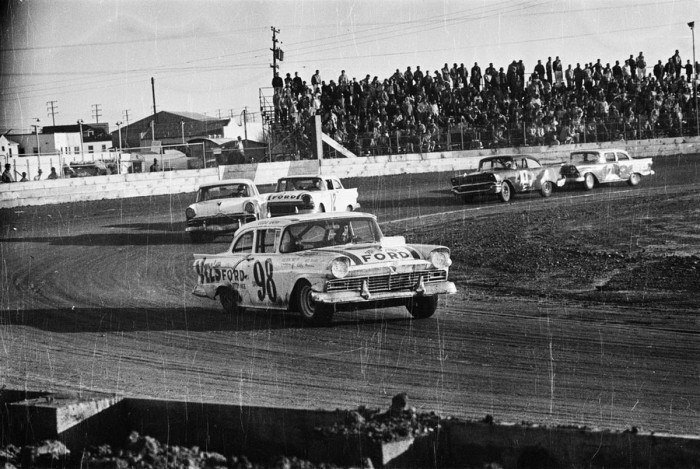 In 1930’s, stock-car racing arose on Daytona Beach in Florida, then moved to tracks later on. The largest governing body of stock-car racing, NASCAR (National Association for Stock Car Auto Racing), was later founded in 1947. Drag racing, primarily called as Hot-rod racing, is a rapid acceleration contest originated in the United States and in which two contestants from a standing start side by side in a flat, straight course, mostly running on a quarter-mile long. Hot Rod is a privately built and designed automobile constructed to provide maximum acceleration. Hot rods originally were modified stock-racing cars, but they eventually became like any other racing cars, though highly constructed and specialized. Numerous national and international records fell to hot-rod drivers and builders in the period following World War II. Hot-rod racing rapidly spread after World War II. The National Hot Rod Association was later founded in 1951. The sports spread to New Zealand, Australia, England, Canada, Italy, Germany, Sweden, and Japan and was recognized by FIA (Fédération Internationale de l’Automobile) in 1965. Midget-car racing began in 1940’s in the United States and continued with even smaller rear-engine cars, called Karts, in the 1950’s. Miniature racing cars compete on ¼ or ½ -mile dirt or paved tracks and usually run no more than 40 km (25 miles). Karts were also later introduced and raced in England, throughout the rest of Europe, and in New Zealand, Japan, and Australia, with International competition in 1960’s. Sports-car racing, another form of racing involving cars built to combine aspects of touring and racing cars, the earliest cars being European-made, was introduced and became popular later around 1930’s in the United States. Most of the world’s sports car racing are conducted for amateur drivers by local and regional organizations. Amateur members mainly compete in local rallies, but general public interest is mainly in the professional races. Although sport-cars are usually not constructed and designed exclusively for racing, nevertheless, they are able racing machines and are often entered in competitions with others of their class. US governing bodies, CASC (Canadian Automobile Sports Committee) founded in 1951 and SCCA (Sports Car Club in Americas) founded in 1944, cooperated closely for successful sports car racing events. Off-road racing is also a form of motor racing conducted over unmarked, rough, and often desert terrain. Off-road races are typically organized vehicle type – car, truck, motorcycle and ATV’s (all-terrain vehicle) – in various custom and stock classes. Still primarily a North American racing form, off-road racing has also become popular in Australia and Japan. Speedway racing is a form of motor racing usually run on an oval and flat tracks. Speedway racing became the dominant and leading racing form in the United States. Speedway racing originated in Australia in 1920’s and became popular in Europe in the 1930’s and remained so. Brooklands, Surrey, is the first venue built in 1906 for the sole purpose of motor racing. The track featured 4.45 kilometers (approx. 2.75 miles) circuit, 100 ft. wide (30 m), with curved banked corners to a height of 8.5 m. Other types of races like endurance, relay, handicap, and sprint were run at Brooklands, as well as long-distance runs in 1932. Brooklands closed 1939 during war-time, but the circuit did not survive the World War II. The 2.5-mile long Indianapolis Motor Speedway, one of the oldest purpose-built motor racing circuits still standing at Speedway, near Indianapolis, is possibly the best-known speedway in the United States. It opened in 1909 for racing with unpaved track but was later on paved with brick in 1911 for the first Indianapolis 500 race. This sports venue can hold the largest capacity worldwide, having a maximum capacity of more than 250, 000 seated spectators. Indianapolis of the East, lately known as “Thompson Speedway Motorsports Park”, in Thompson, Connecticut, is the oldest oval track paved with asphalt in the United States. Grand Prix racing has its roots in the first organized Grand Prix racing that began in France way back 1906 at Le Mans. Grand Prix racing, is an automobile racing on closed highways or on other courses with somewhat stimulating road conditions, became the most popular kind of racing internationally. The Association Internationale des Automobiles Clubs Reconnus, motor racing governing body, was later founded by the national clubs in 1904 but was later renamed to Fédération Internationale de l’Automobile (FIA) in 1946. The Grand Prix races were run in 1907 and 1908 and the not again until the second half of the 20th century. The first Italian Gran Prix racing was held in 1921, Belgian in 1925, the German in 1926, and Monaco began in 1929. Races were made on closed circuits of 5-6 km with total distances of 250 km to 650 km in one lap. The cars of each nation were all painted with one color for easy identification: Red for Italian, Blue for French, Green for British, and White for German. From 32 entries submitted by 12 different automobile manufacturers, the Hungarian-born Ferenc Szisz (1873–1944), won at the 1906 Gran Prix racing event. Grand Prix racing resumed in 1947 and then three years later, a world championship for drivers was instituted, commonly involving point tallying for some 15 Grand Prix races, including those of the Netherlands, Monaco, France, Belgium, Germany, Great Britain, the United States, Italy, South Africa, Canada, and Mexico. Grand Prix racing became popular worldwide from the 1950’s after the world championships for drivers were established. Hill Climb racing is a short-distance race for motorcycles and automobiles up the mountain roads, running over a total distance of at least 350 m. Most cases require each competitor to cover a total minimum distance of 10 km and with a minimum course length of 5 km. It is one of the oldest forms of motorsport, which took place in France as long ago as 1897. It was an early method of testing automobile’s performance and power characteristics but was later turned into a known racing sport. In modern hill climbing, each driver is alone on the course, racing only against the clock. The person which could climb up the highest with the shortest time span will be declared as the winner. This competition is practiced and organized in most parts of the world, but the United States attracts huge crowds and top performing drivers. Rallying is an automobile racing competition over a specified public route with a navigator and driver attempting to keep a predetermined schedule between checkpoints. Participants compete in off-road areas or closed public roads on a point-to-point set-up where drivers together with their co-drivers compete and rally to a set of points. The course is generally unknown to the participants until the start of the rally. This kind of competition began in 1907 with a Beijing to Paris event, having a total distance of 7,500 miles. The rally is usually conducted over a number of specific stages on any terrain. During the rally, the “navigator” reads navigation details to the driver, allowing them to complete each rally stages as quickly as possible. The winner of the competition will be based on the lowest elapsed time over the course of the event’s stages, including penalties. Rallies became very popular in Europe after World War II, and other locations and international competitions are established. Weekend rallies have been commonly practiced worldwide, ranging from those created by local clubs to events sponsored by bigger organizations. Top event is the WRC (World Rally Championship) which began in 1973, but different countries also have their own national championship events. Some of the famous rallies include Monte Carlo Rally which began in 1911 and continued thereafter except during war time. Another famous rally event was the Dakar Rally which conceived in 1978, covering up 9, 300 miles and was considered one of the most grueling rally events. High level racing drivers are usually paid by the team, or by event sponsors. In spite of what might be famously known by most people, racing drivers in general don’t have great reflexes. Some physiological assessments of expert on racing drivers shows the two attributes that emerge are: (1) racers’ close over the top need to control their surroundings (the mental angle), and (2) a strange capacity to process quick moving data (physiological). In this, scientists have noticed a solid connection between racers’ mental profiles and those of military pilots. Because of the execution capacities of advanced automobile racing, drivers require an abnormal state of wellness, center and the capacity to perform at abnormal states for long stretches in a characteristically troublesome environment. The racing drivers mostly gripe about torments in the lumbar, shoulder and neck areas. Specifically, automobile racing that uses cars such as formula cars produces a generous measure of downforce to corner at speeds that requires extremely large g-forces on drivers. Speed has been the major ultimate goal in almost all kinds of racing today, although concerns for safety has been brought up by governing bodies every now and then and has prevented some of the racing events like steady climb in speeds before. In 1911, speed has risen from 120 kph to nearly 260 kph in 1970’s during the Indianapolis 500. Speeds are somewhat lower in Grand Prix racing, where the number of curves and the terrain vary. 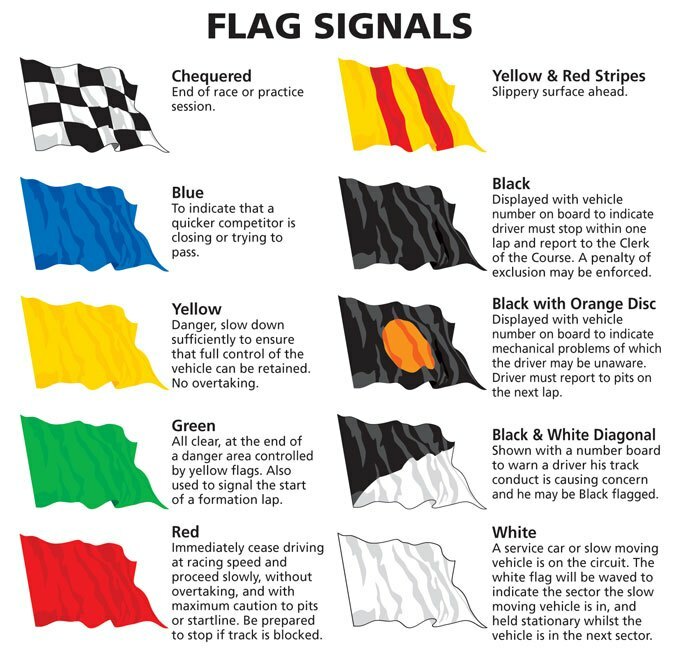 In many types of automobile races, mainly those held on closed courses, flags are displayed to indicate the general status of the track and to communicate with the competitors. While individual racing series have different rules, and the flags have changed over the years (e.g., red used to start a race), these are generally the commonly accepted flags. Below list shows the Daytona 500 winners starting from late 1990’s to up date. Below list shows the winners of Indianapolis 500 starting from late 1990’s up to date. 3No competition between the year 1917–1918 and 1942–1945. 2004 after 450 miles, and in 2007 after 415 miles. Below list shows the winners of Monte-Carlo Rally winners starting from late 1900’s up to date.